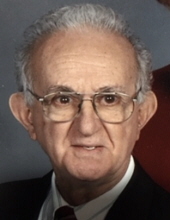 Ralph Anthony Cardello, age 92, of Bridgewater and Convent Station, New Jersey, passed away with loving family by his side on February 10, 2019. Born in Brooklyn, New York, he attended Midwood High School. World War II Veteran of the United States Army in 1945, he was awarded full scholarship to Princeton University where he studied Chemical Engineering, Class of 1950. In 1951 he began a distinguished career with Exxon. Ralph was a Pioneer in Oil Shale Technology years before it became popular. Ralph held Senior Management positions with Exxon Research & Engineering and Esso Europe. He was Senior Executive Officer of Esso Steenkool Technologie in the Netherlands, and ended his career leading Exxon’s Baytown Texas Research Laboratories. He retired in 1985. His favorite life-long pastime was stamp collecting. He was a member of the Knights of Columbus, Morristown and an avid gardener which was showcased at his many homes. Ralph is survived by his loving wife of 68 years Gloria and his 4 children: Rosemary Vance, Christine Modero and husband Thomas, Lorraine Dobbins and husband Bill, Ralph J. Cardello and wife Valerie, 9 grandchildren: James and Rebecca Mundrane, John and Gina Modero, Bryan, Christopher and Lauren Vance, Drew and Vivian Cardello. Step-grandchild, Rachel Havrilla, and step-great grandchildren Leneah and Silas Millar. Relatives and friends are invited to attend Ralph’s Memorial Service on Friday, February 15, 2019 at St. Thomas More Catholic Church in Convent Station at 11:30 AM with entombment at Holy Rood Cemetery immediately following. To send flowers or a remembrance gift to the family of Ralph A. Cardello, please visit our Tribute Store. "Email Address" would like to share the life celebration of Ralph A. Cardello. Click on the "link" to go to share a favorite memory or leave a condolence message for the family.